Try one of the most addictive games ever made now! It’s simple! It’s fun! It’s free! It’s Bomb It! Color Blast! 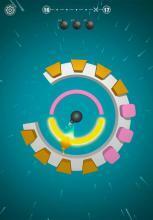 Spin the bombs and challenge yourself by blasting colorful objects until they collapse. Tap and shoot at just the right moments! Test your aiming skills with this exciting shooter game! Tap your way to victory! You’ll really get hooked on Bomb It! Color Blast! You can improve your reflexes with this simple, yet challenging, spinning bomb shooter. 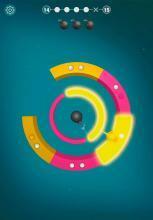 Simply tap the screen at the right moments to blast spinning obstacles or switch their color. Keep your eyes peeled for the rim color switches, and many other features and obstacles that will pop up as you blast your way to victory. With a limited number of bombs, you’ll need to plan your wave of destruction wisely. This game is simple to play, but don’t assume it’s easy to master. Improve your reflexes with this cool, time killing game. Tap based target shooting has never been this fun! Awesome Game Features: A stunning visual style! Perfectly simple gameplay that will really help you kill time! All the colorful destruction and mayhem are a real blast. This game is fun to play anywhere and anytime! Many exciting levels to discover! Each one reveals a new type of object to destroy. Lots of boosters and power-ups you can unlock and use while mastering the game. An exciting boss mode! Bomb It! Color Blast! lets you discover over 100 exciting levels that will keep you challenged throughout the game. Try your luck in the boss mode or improve your reflexes while you master the endless mode. Each one will help you boost your skills and blast different types of obstacles. Ready for an explosive adventure? Bomb and destroy the spinning objects while you enjoy all the colorful fun! Have a mega blast while you master this spinning game of destruction today!